I hope everyone is having a great weekend! It's been a busy one for me! Thanks so much for all the birthday wishes on Friday! I had an amazing day! Today I am spotlighting Erica from Erica Finds! This girl loves to race! 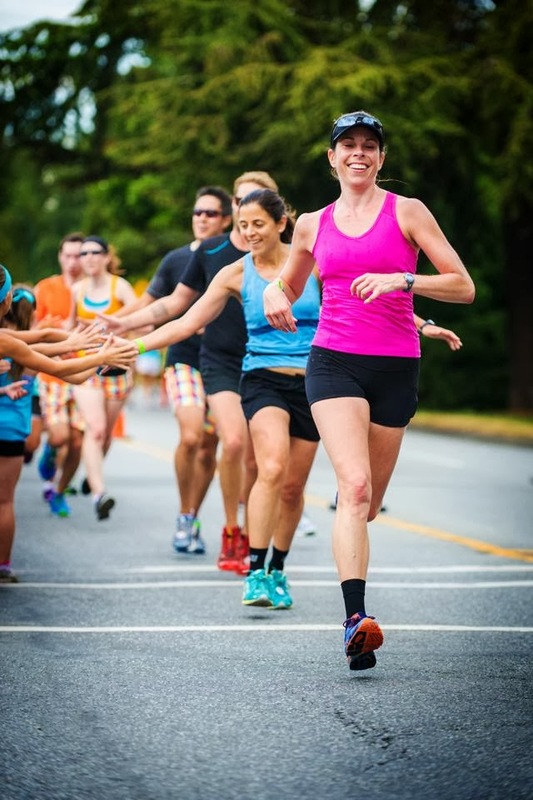 She has run so many races including half marathons and full marathons! Such an inspiration! And today...she is running the NYC Marathon for the 14th time!!! Keep reading to learn more about her! I ran in high school and was pretty sedentary in college. It showed! I started running in 1993 when I graduated to lose the weight I had gained. By 1994, I was racing on the roads and I never looked back. I started with 10Ks and progressed to the marathon by 1996. 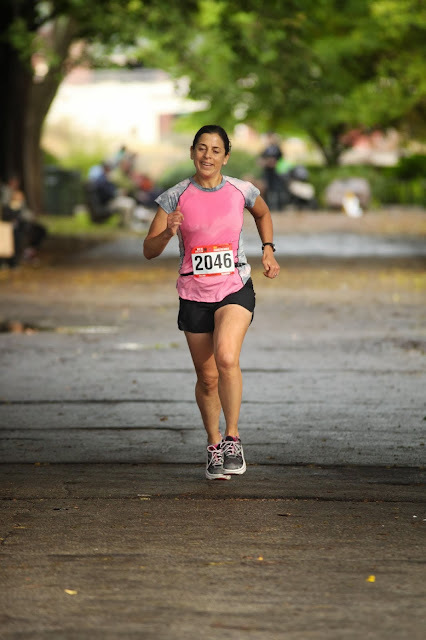 I have run over 300 races including 35 marathons, over 100 half marathons and many others. My favorite race is the New York City marathon. I love the energy, the crowd, the city, the course, the diversity – everything about it. On November 3rd, I will run my 14th NYC marathon. I need 15 by 2015 to be guaranteed entry for life. I will be there next year, too, for sure! My favorite distance is the half marathon. I am most competitive at that distance, but I also love that it is great workout. You can also recover quickly and enjoy the day/weekend when you run a half. I love to do weekend trips with my running friends to do destination half marathons. I have done Carlsbad, CA, Napa to Sonoma, Seawheeze in Vancouver, Austin, NYC, Cleveland and many more. It is a great way to see a place, stay fit, meet people and have fun! I am pretty low maintenance. I generally get up about 45 minutes before I need to leave. I lay out my clothes and bib and stuff the night before so I won’t forget anything. I usually eat a banana and an energy bar (I prefer Picky Bars or Kind Bars these days.) I like to get to the race site with plenty of time for a potty stop, gear check and quick warm up jog. Ooh. This is a hard one. It is like picking a favorite child. I LOVE my Hind Dodgem shorts – they have boy shorts underneath and a zip pocket. They don’t make them anymore. I am devastated. I have 3 pairs that are slowly degrading! I also LOVE the Moving Comfort Endurance Tank top. I have 6 of them – maybe more. They have a built in bra and a pocket in the back. They are my go-to for warm weather running. I got them at Sierra Trading Post for $20 each. I bought so many because I learned my lesson on the shorts! I am also an Ambassador for a great Chicago company called Swirlgear and love their cap sleeve tops. I also LOVE my sneakers. I wear Karhu Fast 3s and Mizuno Wave Rider 16s. I have also been trying out some Hoka One Ones. 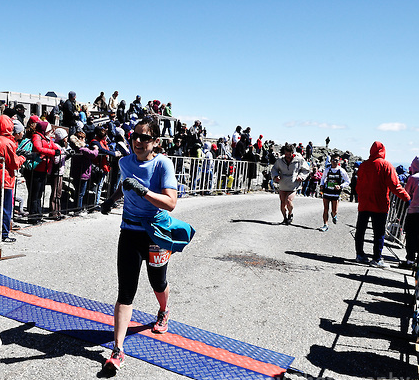 I never used to and I always GAINED weight during marathon training – ironically. I started wearing a heart rate monitor and realized I was not burning as many calories as I thought. This year I did an elimination diet (post on this here: http://ericafinds.com/2013/07/try-to-eliminate-what/) and went gluten free, dairy free and egg free. I also added supplements to boost my adrenal gland function, Vitamin D and B-12 shots because I was deficient. I lost a few pounds and my running has been strong, too. I am testing the foods now, but plan to continue to try to eat gluten and dairy free most of the time. I really want my eggs back! Cotton clothes chafe. No more explanation needed for this one! Pacing matters. Just because you CAN run fast in the beginning of a long race does not mean you should. Be patient and run smart. Trust your body. Injuries are your body’s way of telling you that you need to give it a rest or make some changes. If you ignore it, the outcome will not be good. Less can be more. I run fewer times per week now, but more miles per run and more focus on quality over quantity. Best laid plans are meant to be changed. If I go out to do a specific workout or pace in a race and it feels bad, I make modifications or switch my days if I can. A bad workout is not always better than no workout! I have so many. It is hard to pick one. I remember the elation I felt at mile 24 of the New York Marathon in 1999 when I realized I would break 3:30 for the first time. I also remember the first time I ran the NYC marathon and the roar of the crowd coming off of the 59th Street Bridge. And the first time I ran Boston and hit the scream of the Wellesley girls at mile 13. I remember many wonderful half marathons run with my NYC running partner, Rasko, and talking and catching up while running a great pace. One of the lasting memories I have is running the NYC marathon in 2001 after the September 11th terrorist attacks. There was such a mix of sadness and fight in everyone. I cried so many times during that run, but truly appreciated the support from a scarred city. Here are all the different ways you can connect with Erica! Thanks so much for sharing with us Erica!!! And good luck with your marathon today!!!! QOTD: What is your favorite race? Don't forget to enter my giveaway for one of Pavement Runner's awesome running shirts!! !